CCA has updated their website. (I guess tis the season for web designers to get to work.) It is much flashier, but I'm not sure it is an improvement. Of course, look at my site. I am not in a position to cast stones. "The Coal Creek Armory Outpost is a training facility used for private courses and not open to the general public, as of October 2012." So maybe we didn't need two gun shops/ranges within spitting distance of each other. After navigating several links, I found this post about the new owners. The changes are probably a result of this new ownership. Makes sense to me. Wow. Free transfers at the new Coal Creek Armory Outpost until the end of March. Info at the CCA Outpost Facebook page. I was out in Kingston last week, so I stopped by Frontier Firearms and the Coal Creek Armory Outpost location. This isn't meant to be an in depth review of either location - just some comments from a guy who stopped by each for a few minutes. As for guns, they had a good selection of long guns. I didn't do a count, but it seems like they currently had fewer handguns than I remember seeing at the old store. I know of several instances of people who have driven the extra miles to get to Frontier due to the company's reputation for good customer service. In fact, my father-in-law skipped by Gunny's and CCA to make his last handgun purchase at Frontier. The Outpost is a small shop. They have a small retail space that currently has some shelves for various gun accessories. They cannot sell guns yet from this location - they are still waiting on the paperwork to make it through the process. According to the guy that was minding the store, they were about two weeks away from getting the approval. (Maybe less now at the time of this post.) He was very friendly and probably would have been happy to chat had I stuck around longer. The range reminded me of the Lovell Road CCA location, but the new lights make a difference as it seemed nice and bright. There were five or six lanes. No cats were spotted at the Outpost. There isn't a lot to say since they aren't up to full speed yet. Before I share my thoughts... a couple of points of reference. I'm too big of chicken to run my own shop, so I am no expert on running a small business. I believe the goal of business is to make money. I can only assume that CCA wants the entire Knoxville and surrounding area market for themselves. They are taking the fight to Frontier and must be leveraging the Knoxville store to support the Outpost operation. (I do like the Outpost name - makes lots of sense and fits perfectly.) I am guessing (complete speculation here!) that Frontier had to take on some debt and CCA thinks they could push them over the edge. If it were me, I would have expanded to an under served area like North Knoxville (Powell, Fountain City, Halls). It would build an even stronger foundation for expansions in contested areas. Opening a shop/range where there was none would also be good for the gun community, too. My biggest fear is that the expansion stretches CCA too much and the Outpost takes some of the Frontier business resulting in both businesses folding. As with most things, time will tell. According to this post on the CCA blog, the Kingston store is now open. Let the games begin! "SPECIAL ANNOUNCEMENT! Coal Creek Armory is opening a new location 1 mile off I-40 on Gallaher Road in Kingston TN! The new location will offer everything our Knoxville store has including an indoor A/C & Heated range!" So they are opening a store between Frontier Firearms and the interstate? You are a really handsome guy. I thought we had a small moment when I checked out before you today and we candidly spoke about what gun i was holding. Tell me what gun it was and what stall you were in. id like to hang out sometime if your interested." I'll make a joke about just about anything, so please don't take this as bashing his sexuality, but I bet the gun conversation would have been fun. Also, I suggest referring to lane numbers and not stalls. The right way to shoot 9mm in .40 involves making some hardware changes. The wrong way involves failures by multiple parties. I'm going to keep claiming to be a new shooter as long as people will let me get away with it. When this happened, I think it was my third time shooting pistols, so definitely qualifying as new. The first time shooting pistols was with a friend on his family farm. The second time was the Basic Hand Gun course at Coal Creek Armory. One of the goals of the course is to teach you "how to select proper ammunition." You probably see where this is going now that I've set the stage. I was feeling good about what I learned in the course, so I convinced a buddy to go with me to CCA to rent some guns and a lane. I don't remember exactly what we were shooting initially - Beretta PX4 Storm, Kahr CW9, and maybe something else - all in 9mm. We finished up the box of ammo and decided to try the Glock 22. We swapped guns and took our new box of ammo out to the lane. I started loading the magazine and took the first turn with the gun. After a string of failures to fire and feed, our trouble-shooting quickly revealed we were shooting 9mm instead of .40 S&W. I have visions of the bullet tumbling through and bouncing around the barrel. Shame on the CCA employee who gave us the wrong ammo when we switched guns. I expect them to have some level of expertise and pay attention to details. Shame on me for not checking the ammo. Ultimately I was the last safety as I loaded the magazine, but since I did not look at the box or closely at the rounds I failed, too. While I didn't have the experience to recognize the ammo by size, shape, or feel; I could have easily seen what was printed on the box. No one got hurt and they didn't make us pay the rental fee. Lesson learned. I bought the running shoes and actually ran more than once... 3 runs for about 3 miles on average. The last run was probably the easiest despite the heat. I went to Coal Creek today and shot about 150 rounds of 9mm in the CZ. The only good thing I have to say about that is that no one got hurt. Even a little practice makes a lot of difference. I need to figure out how to get to the range more often. My wife subscribes to the Daily Candy for Atlanta and a few other cities. The Daily Candy is a hipster newsletter with tidbits about local culture. The latest one for Atlanta included a new place to get a group together for a party. What: The state-of-the-art shooting range offers all-inclusive group packages ($50 per person, groups of ten) for special occasions (i.e., breakup therapy with the besties). Maybe Coal Creek Armory should start having birthday parties and corporate events. I noticed the other day that they were painting at CCA and some things were shuffled around. Looks like they are getting a nip tuck. It used to be on Half-off Depot, but one of my friends found the half price deal here. 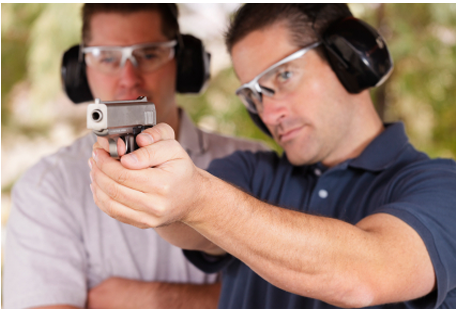 Get a one-year membership to Coal Creek Amory's indoor shooting range for $99.50. The Coal Creek team is at it again. They must have too many Glocks as they are giving another one away. "TEXT the word "GLOCK" to 508-315-9971 and you will be entered automatically. Winner will be chosen at random on Sat March 26th. You must be a TN resident to be eligible to win." Via the CCA Facebook page. "We at Coal Creek Armory have purchased software that allows us to send text messages to our customer base so that everyone can be notified of special promotions and giveaways we have going on. Text "Fire" to: 508-315-9971 and you will be automatically added to any future messages. I promise WE WILL NOT bombard your phones with meaningless mishmosh or sell your information to ANY outside source!" If I don't win the GLOCK, then I may need a special discount. I was out at CCA this week and renewed my range membership. They have a ton of pistols in stock right now. They are basically laying on top of each other in the display case. Also, don't bother leaving a guess for their "how many casings are in the fish tank" contest. I am very confident I nailed it - plus or minus a thousand. Coal Creek Armory: Gun Prices Are Too Damn High! Some sale items, plus they are giving away two Glocks. No details on the give-away. They say you need to go by. I was thinking about shooting tomorrow if I can get a kitchen pass, so maybe I can learn more. Update - I guess I'm going to have to become a fan on their Facebook page. Apparently they are going to have more content there - including the details of the give-away. You have to guess how many casings are inside an aquarium.